ILLIG offers stacking systems, the features differ on a certain extent on quality and reliability of the downstream of the equipment. 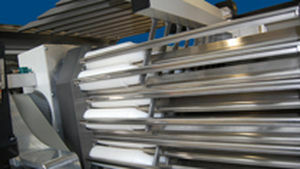 A wide variety of stacking systems are available, with automation level, output and a wide range of variety of products. This ranges from manual cup removal to fully automate stacking system and many more. Cups move directly into cages through the use of ejectors or are sucked up and stacked during the phase with use of different devices. This prevents cup deformations and a well improved cooling process is used. Automatic singularization can also be opted. Cups can be carried horizontally or vertically.